1. Reading in dim light ruins your eyesight. While this is one myth that parents around the world have loved for generations, it has very little scientific backing. 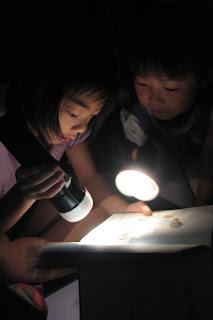 Reading in the dark can cause a temporary strain on the eyes, but it rapidly goes away once you return to bright light. The practice has been blamed for increasing rates of myopia (nearsightedness), but Carroll says those claims don't align with the evidence—we're living in the best-lit conditions the world has ever seen. "Seventy years ago we were reading by candlelight and weren't going blind," says Carroll. "There's no evidence for this whatsoever." 2. Using cell phones in hospitals is dangerous. Despite the signs in most emergency waiting rooms, studies have found little to no significant cell phone interference with medical devices. In 2005 the Mayo Clinic ran 510 tests with 16 medical devices and six cell phones. The incidence of clinically important interference was a mere 1.2 percent. A 2007 study on cell phones "used in a normal way" found no interference during 300 tests in 75 treatment rooms. 3. Fingernails and hair grow after death. "Growing hair and fingernails is a very complex hormonal task," says Carroll, one that can't happen after one has died. So how did this myth get off the ground? It could be because after death the skin begins to contract, which could give the appearance that the nails are growing. 4. We use only 10 percent of our brains. The notion that our brains are not running at full speed simply doesn't hold up. "Numerous types of brain imaging studies show that no area of the brain is completely silent or inactive. Detailed probing of the brain has failed to identify the 'nonfunctioning' 90 percent," Carroll and Rachel Vreeman, an assistant professor of pediatrics at the Indiana University School of Medicine, write in the British Medical Journal study. Carroll says the notion may go as far back as the snake-oil salesmen of the early 20th century, who used the myth to sell a tonic that would increase brainpower. 5. You should drink at least eight glasses of water a day. The source for this myth may be a 1945 article from the National Research Council that claims that a "suitable allowance" of water for adults is 2.5 liters a day, although the last sentence of the article notes that much of that water is already contained in the food we eat. Existing studies suggest that that often-omitted fact is key to understanding water intake. We get enough fluids from our typical daily consumption of juice, milk and even caffeinated drinks. And drinking too much water can cause water intoxication, a severe electrolyte imbalance in which cells swell with excess fluid, and even death. 7. Tainted candy from strangers is a Halloween threat. While not included in the British Medical Journal study, this is one of Carroll's personal pet peeves. Each Halloween brings a slew of stories about poisoned candy—some hospitals will even set up X-ray stations for the particularly cautious trick-or-treater—but there has never been a documented case of a stranger poisoning Halloween candy, he says. There have, however, been a few instances of relatives doing so.